About a year ago, I did a post on my collection of creamers. It came in handy today as I scurried about last minute preparing this post. I'm pretty sure that I'd take the photos differently now, but this is how I did it then. I love your collection - and now will always be thinking of you when I see lone creamers. Do you have specific favorites? I love Anne of Green Gables one a lot!! Thanks for hosting! They are all so sweet and I love your new banner, too. I'll be late to the party....see you in the morning! Sweet hugs! Vee, que bonito todo!!! 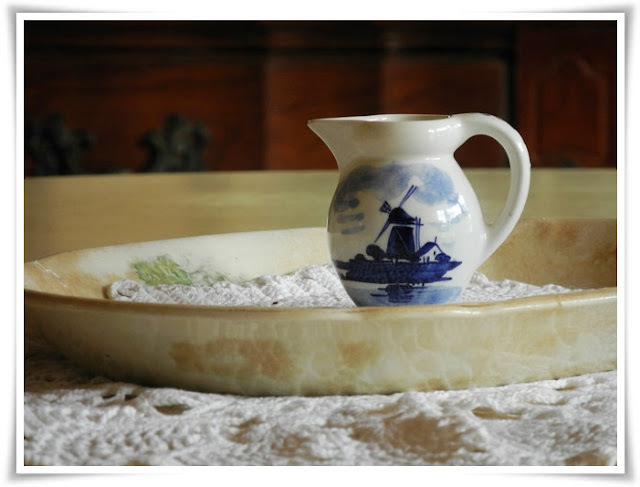 I love your creamer with the windmill it reminds me of of where my aunt lives.. Holland Mi. I would enter,but I don't have anything that pretty NADA!! I just love little creamers Vee and the chicken and the yellow lily are so sweet. Now, I have to get scrambling and do mine as I forgot about it. Where did March go to??? The little chickie creamer is sweet, the others more useful I'm sure. I have a reasonable collection of cream & sugar sets with the odd lone creamer and I love using the different ones when company is over. The chickie is so cute. I'll post in a bit and link up! I totally agree - darling header and post!!! Your welcoming Easter header is lovely Vee! I would choose Anne of Green Gables as I'm an old fashioned girl. I would have bought it as a souvenir too. Just as I would buy this set of cards if I saw them in my stationery shop - a nice card to send to friends. Thank you again for hosting another Note Card party Vee. Wonderful new banner. Terrific idea with your cupcake papers. I have quite a collection and have always thought they were too pretty to be in the cupboard. I know what I will be doing this aft! Would you believe that a dear blogging buddy just sent me all those cupcake liners today? She didn't think that my apothecary jar looked as good as it could. (I'll be posting about it on Thursday.) Hope that you have a fun afternoon with it. I had a marvelous lot of fun this morning with mine. a couple of them from your Grandmother. beautiful pieces of dish ware, I know. I also like your new Spring banner! Your new header is really stunning, Vee - full of the life and colour that signifies hope at this time of year. Great job! I love the creamers, too, especially the Anne of Green Gables one. These would be lovely note cards. Those creamers are fantastic. I was just thinking yesterday that I need more sugar and milk sets for my tea tables. I'm fascinated with your note card party link-up, seems like so much fun. I'd love to know more about it. 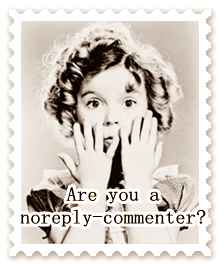 Veronica, I tried to send you a personal invitation, but you're a no-comment return blogger. Anyway, all the information can be found by clicking on the button in my sidebar. There's really not a lot to it...just find four photos already posted on your blog any time in the past and create your post and link up directly to that post. We'd love to have you join us. I like your creamers -- pretty and fun! Oh, how lovely! I adore all of them! 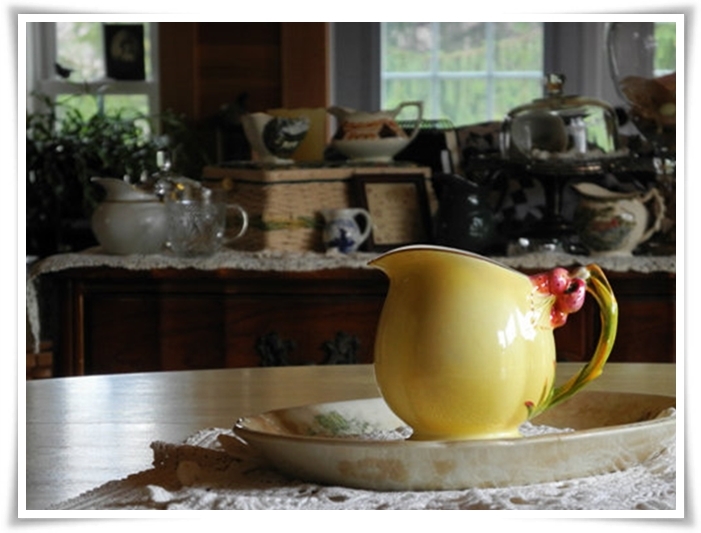 I happen to feature a photo in my post that was taken in one of the Green Gables bedrooms. Funny how that turned out! Love the top picture with the cupcakes wrappers in the jar. How clever you are to make art out of them. They are so colorful and fun. Love your Anne of Green Gables pitcher! Vee, I love each and every one of your creamers. They're so pretty! Also - I'm loving your header!!! It's beautiful. They are all so beautiful and would make a card I would like to receive. Nice subject. So beautiful! I especially like that Anne of Green Gables pitcher. Lovely! I'm found you on BJs site and am following you on Feedly! Hope you'll stop in sometime. These are just delightful. I scurried too but just did not have time to participate this morning. I need to prepare in advance!! I am about to leave the house for awhile but will visit everyone when we get home. Love little pitchers, I collect a particular kind of them seen in my sidebar. Of course I love the last best. I just got home and realized tis time for the cards, which thankfully I had done awhile ago. Thanks for hosting a fun party. Now to visit some more. 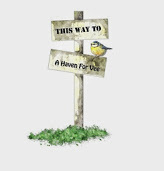 Vee, I love your springy Eastery header photo. I had a day of babysitting here and am enjoying my visiting now in bloggly land. Such sweet little pitchers. I love your creamers! What personality they have!! I adore the tiny windmill creamer. Your new header is fabulous .... so Eastery & Springy .... perfect! =) Thanks for hosting! I was so excited that I remembered this month! I love your photographs and what pretty note cards they would make. Your header is so creative and everything in it reminds me of when I was a little girl and how much fun it was looking forward to all those goodies in my Easter basket and getting all dressed up on Easter morning to go to church. It's so special when our photographs bring us back to such fond memories. This is my first time joining and I had fun trying to put it all together and now I am looking forward to next month. You have some pretty little creamers. My favorite is the Anne of Green Gables. I hope to get some photos together and join the party. Your creamers are all so pretty, Vee. My favorite though is the yellow tiger lily. Great choice for your note card party this month, Vee! I see no evidence of "scurrying" (although I can well imagine it, because I've done it), only evidence of a lovely, loved collection. 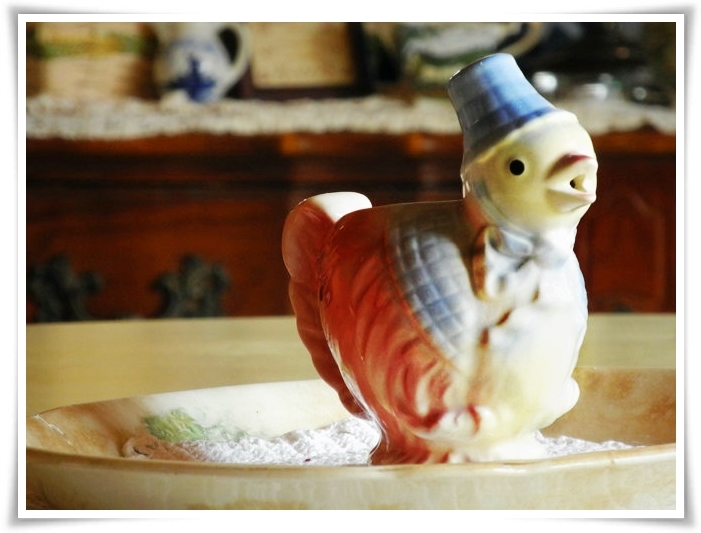 I love the Anne of Green Gables creamer, but the little chickie appeals to me on this eve of spring's first day. I like the second one best--thanks for hosting this! I love old sugar bowls and creamers. I was actually on a hunt for some yesterday for my kitchen, and what I noticed is that the new ones just don't have the creativity of the old, picturesque ones. The sugar bowls don't even have handles anymore. That's the prettiest part. Anyway, I digress. I love your collection, and because I'm an Anne loyalist, the Anne of Green Gables one is my favorite this month. Good morning! I'm excited to join the party and start visitin'! Thanks! Finally linked up, and I also want to add that your header is fantastic!! I'm jealous! I LOVE YOUR WHOLE NEW BLOG LOOK! IT MAKES ME HAPPY AND SMILE, JUST TO COME HERE! -clapping hands- -doing happy dance-<--Both those things, much needed, on our snowy, cold beginning of Spring! But the whole blog look... It is sooo pretty! I love all of those creamers. My favorite the little blue and white one. These pics make a lovely collection of note cards. Good morning! I love everyone of them! I simply couldn't chose, so I won't. I just love old creamers for some reason. Enjoy your day! Your creamers are sweet....and remind me of yesterday when i was having tea with my friend and picked up my grandmother's creamer to add a little milk to my tea....only to find I had forgotten to fill it. 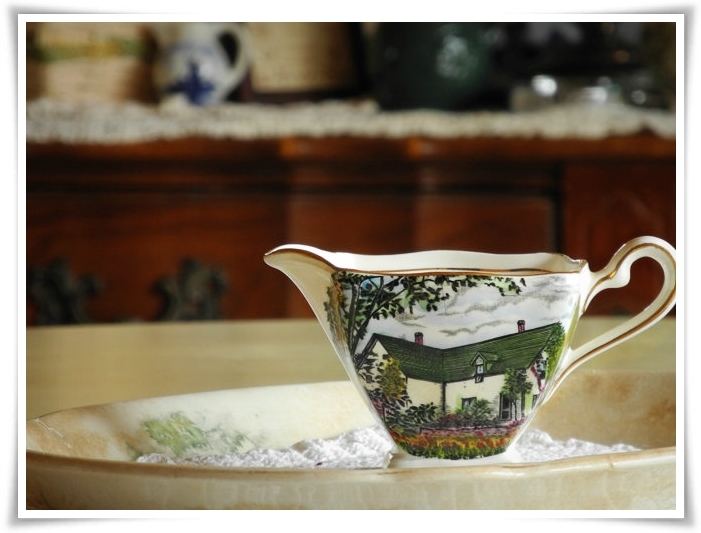 It's nice to use the treasures we've accumulated over the years...I always bring them out when friends come to tea. A lovely collection of notecards, Vee. How fun that you found a 'chickee' creamer! Now I'm off to check out your party. I love the little chickie! Wish I could join in but I've been working on my new apple computer and trying to figure out how to work everything. I'm a cup nut, so I love the cups and the photos! I love these photos, just gorgeous as usual!!! Beautiful Note Cards and header Vee!! One day I'll have to try to figure out how to join in on your party. Your guest's cards are all so amazing too! Your creamers are just absolutely lovely. Forgot to say your header is so cheerful, love it. I love the country feel to these photos. on that made me smile....It said, "A little bit country". little bit country. These are just the right touch. Are you calling me "country"? I call me "grandma's attic." Ha! Help, Vee. I posted the wrong link the first time. Can you make it disappear? Thanks!! A very cute note card subject. All of your creamers are pretty. I think my favorites are a tie between 1 and 4. Your header is so cheery, springy and downright cute. Those little chicks in their tutus make me smile. Vee, I love all of your creamers especially the Anne of Green Gables one. They would all make gorgeous note cards. I thought I had already left a comment, but truthfully there is so much beauty here and everywhere in your Note Card party, I might have been distracted. I wanted to thank you. Each month I meet more and more wonderful friends of yours. I have pockets full of inspiration today, thanks to you. Hoping Mr Linky worked....it jumped to this page before I could upload my photos. First time here (found you through Shane) and am really loving the entries! My first time! Nothing too fancy, but fun! Thanks for hosting you are the still the hostess with the mostess! !